Weddings are special; not just for the bride and the groom, but also for the wedding guests. So, are you the bride who wants to see her family and friends all dressed up in cute outfits to celebrate her big day? Or maybe you’re looking for a special dress to wear to your sibling’s or friend’s wedding? If that’s you, then this is for you! Take a look at our five exclusive wedding guest dresses to up your game. 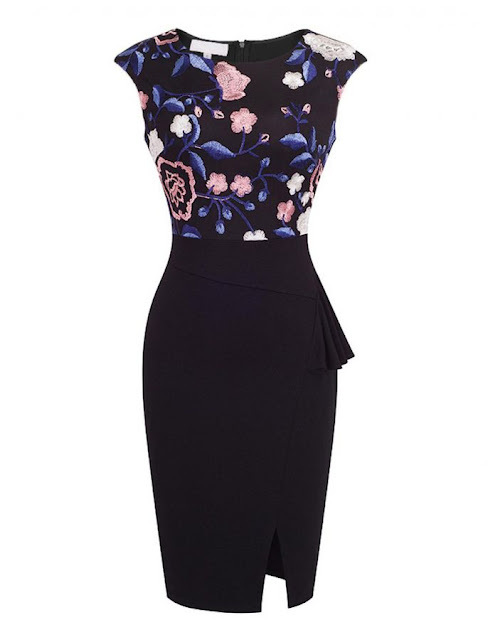 An irresistible black dress with a lovely, eye-catching floral design! This dress is so effortlessly elegant, stunning and stylish. Dress up in this awesome outfit and be ready for all the attention (and compliments!). You can pair this up with a pair of graceful pencil heels or bold box heels and complete your look with subtle earrings. Looking for something flowy and more delicate? 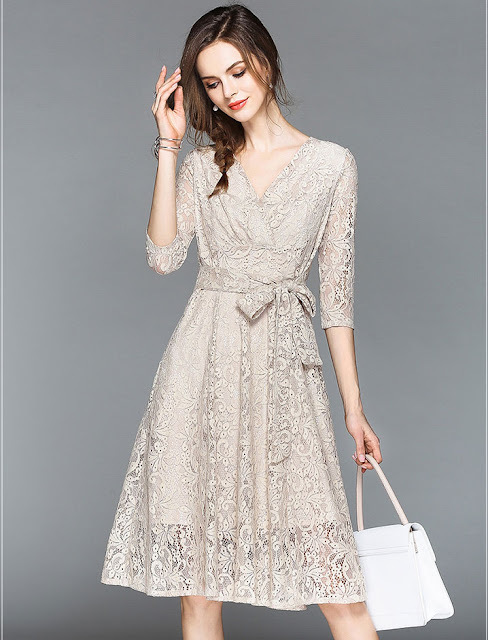 Choose this fantastic lace dress with an attractive color of emerald green and stunning lace appliques. You can pair this dress with elegant diamond earrings and a pair of glossy stilettoes. A matching stone studded clutch bag can work wonders with this dress. Are you attending a wedding in spring? Then this is your perfect go-to dress. It has a blend of all pastel shades which are perfect for the season. The dress has a subtle charm and will go with all kinds of accessories. We think beige shaded pumps with ankle straps will be perfect with this dress! 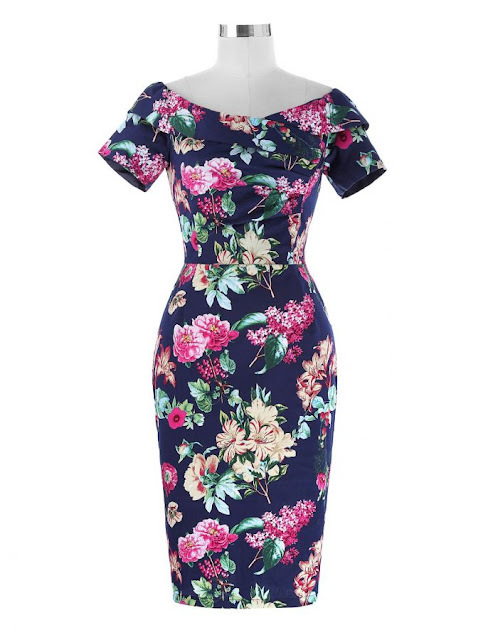 Stand out from the crowd with this darling of a dress! The elegance of the off-shoulder style, the gorgeous lace fabric, and stunning deep navy-blue color form a perfect blend of grace and beauty. You can pair it up with a set of your exclusive diamond or pearl jewelry to add more charm to the dress. Don't forget your special heels and get ready for a stunning top to toe look! Trust us when we say you’re going to be showered with compliments all night long with this frock. Available in 6 gorgeous shades, this dress is going to melt hearts and make you look and feel like a million bucks! 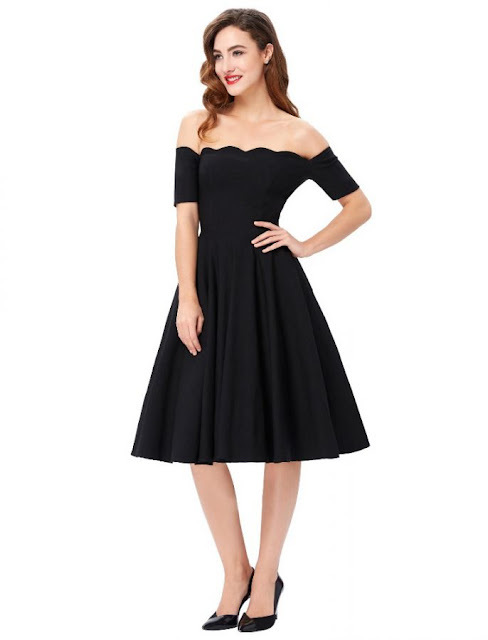 Channel some Audrey Hepburn vibes with the all-time classic black and feminine off the shoulder neckline. Pair it up with your favorite jewelry, a pair of pumps and dazzle through the party! Aren’t these amazing? 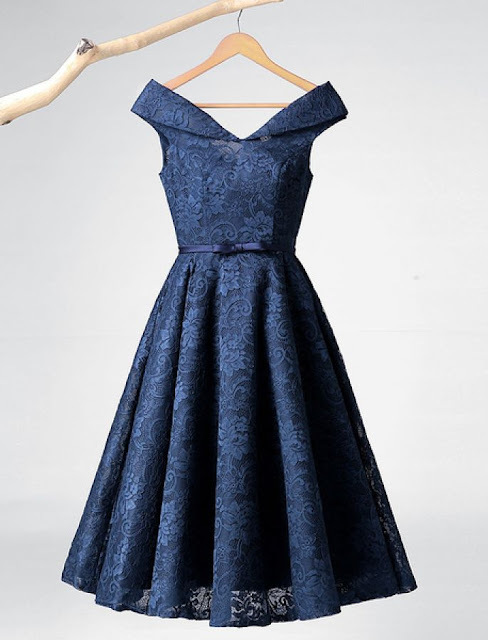 At Dressific, we have many more of these outstanding dresses available for you to choose from. We love everything from the 1950s fashion - from alluring, figure-flattering wiggle dresses to fun and flirty swing dresses! Our 1940s and 1950s inspired dresses come in a variety of styles - from the stunning halter to cute sweetheart necklines - and a myriad of prints - from polka dots to florals and even fruits! These stylish yet comfortable dresses are versatile and fit for almost any formal or semi-formal occasion. Explore our wedding guest dresses now and stay tuned for more! And yes, don't forget to add your comments, ideas, and suggestions below! Vintage dresses are back in trend these days. In the era of 1950s, there was a vast variety in the dress fabrics. There was cotton, wool, linen, rayon, polyester fabrics, etc. which were popular. Along with the fabrics, dresses in the 1950s used to have a huge variety of colors right from pastel hues to jewel tones like royal purple, ruby red, navy, and emerald green. Also, vivid patterns were used to make the dresses look gorgeous! A few favorite trends were florals, plaids, polka dots, gingham checks and stripes. Novelty prints were widely popular too. All this sounds lovely, right? Would you like to know more about the styles of that era? Here we take a look at seven awesome vintage dress styles from the 1950s! 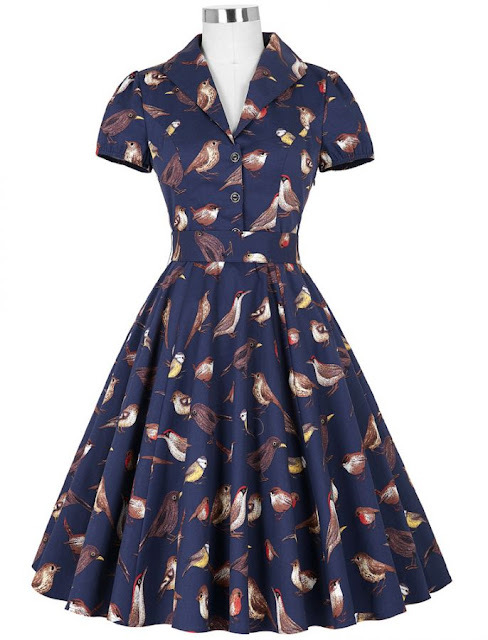 The full-skirted dress is one of the iconic vintage 1950s dress style. In this style, the bodice is fitted with a full circle or gathered like a swing skirt which flows out from the waistline. You get the fullness of this dress by gathering or pleating 6 yards of lightweight and flowy fabric. The skirt is worn with a petticoat or a thin slip for more natural movement. These dresses are also known as swing dresses. The necklines of these dresses are usually scooped, V-shaped, boat-neck, square-neck, or sweetheart. The wrap dress is designed by crossing the fabric in the front and gathering it in the sides. These flowy wrap dresses look best with short puff sleeves and dolman sleeves. Wiggle dresses are often zipped up at the back. The neckline is decorated with tiny collars and bows. The skirts come with welt pockets on the sides, and some dresses can also have buttons in the front. The upper part is sleeveless or has a short cap or elbow-length sleeves. This dress also comes in high neckline which gives an illusion of thinness. The skirt of this dress is similar to a pencil skirt today. It is curved on the hips and tapered down to mid-calf. 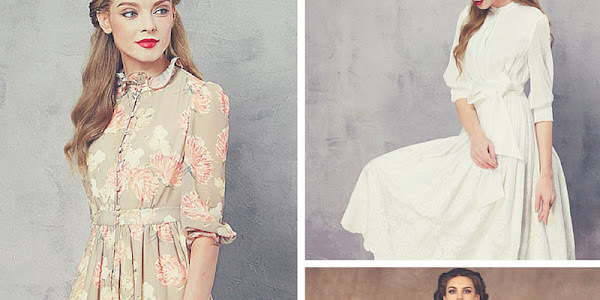 The shirtwaist dress is a famous vintage dress pattern. Shirtwaist dresses have a fitted button-down top, and a full gathered or pleated skirt completed in the bottom. The sleeves of this dress are usually a cap or elbow length. This dress also looks stunning in full-length sleeves. The coat dress is another full-skirted version of vintage dresses. It is somewhat similar to the shirtwaist dress but is styled with a long coat instead of a shirt. The buttons are oversized, and the collar is large. Shoulders on coat dresses are slightly more padded, and sleeves are typically long, or dolman shaped. These dresses come with a matching belt. Due to the heaviness of the big collars, buttons, and sleeves, these dresses are best for fall and winter. The other most popular style from the 1950s is the sheath dress. It is opposite to the flowy skirt dresses but is equally stylish and glamorous in its looks. The sheath dress is tailored, fitted and nipped to the waist. However, the skirt of this dress closely fits the body from the waist down. These dresses carry a sleek, contemporary look which works as a bridge between vintage fashion and modern trend. 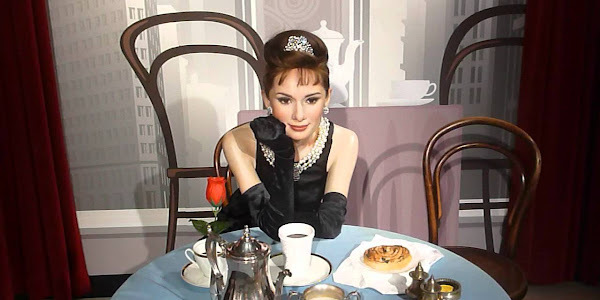 The bell dress is a trend which emerged in the late 50s. It is a combination of the two skirt shapes. The skirt started out being gathered at the waist, puffed out around near the hips, and tapered back in to fit the calf. This created a bell-shaped skirt. Dresses from the 1950s surely were astounding. Do you wish to bring the style of the glamorous decade back in your wardrobe? If yes, take a look at our collection in store now at Dressific.com. Dressific features a range of stunning vintage dresses which will make you stand out from the crowd and dance (or swing!) the night away with nostalgic retro vibes. Happy shopping!